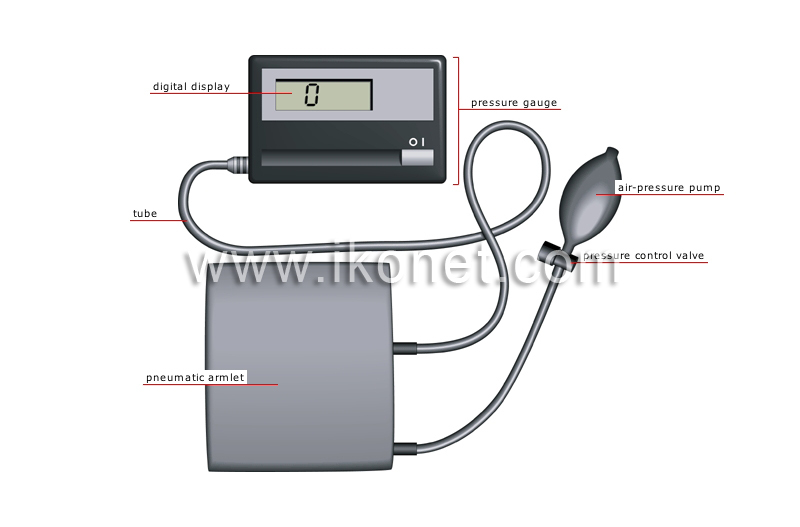 Device composed of an armlet and a pressure gauge; it is used to measure diastolic (heart dilatation) and systolic (heart contraction) pressure. Device that wraps around the arm and squeezes the humeral artery; blood pressure is measured when the air is let out of the armlet. Flexible conduit linking the armlet to the pressure gauge. Liquid crystal display screen indicating blood pressure. Valve used to expel air from the armlet to reduce pressure. Small pump used to blow up the armlet.